Here is a quick little idea for a holiday goodie bag. If you mass produced these you could have them by the front door and ready to give when friends stop by. This way you'll have a little something on hand for the unexpected visitor. Fill them with candy, homemade treats or add some shredded paper and place a small gift inside. So easy to make! 1. Seal any size envelope and trim off one of the short ends. 2. Measure and cover envelope with your favorite designer paper. 3. Punch several stars randomly;cover clothespin with paper and attach star and button with yarn, hemp or thread. 4. 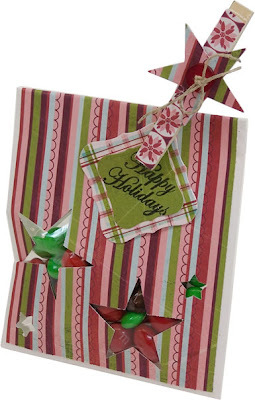 Put clear treat bag or baggie inside to hold gift or treats, fold down top and attach stamped tag with clothespin. Perfect for your kid's holiday parties at school, or any time of the year - the possibilities are endless. 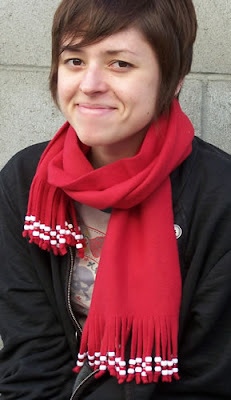 Heidi from our web team whipped up this super cute scarf (shown on Allison) for a local fundraiser and we just had to share. Cut fringe up 4" from ends and 1/4" wide. of fringe using a toothpick to push fleece thru. Tie a knot near the end of each piece. It's that easy. Great gift idea for kids too! Theresa Pulido, professional crafter and author of Hook, Loop & Lock, responds to her time with us in both Rocklin and Citrus Heights over this past weekend. "I had a great time doing my locker hook book signing and demonstration in the Rocklin and Citrus Heights stores this past Saturday. I was able to set up a display with a variety of samples and demonstrate locker hooking techniques--including how to make holiday ornaments. I received such a warm welcome from the customers, they were excited to watch and asked lots of great questions. The stores offered my book at a special price and they had fabric discount coupons for the customers too. 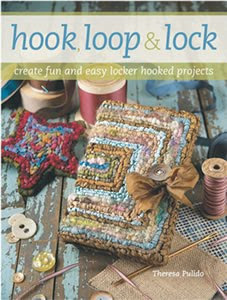 We also gave away a "Hook, Loop & Lock" starter kit at each store that includes all of the tools and materials to make a locker hooked trivet with a ceramic tile. Mother Nature cooperated and the store lights were on this time. In the Santa Rosa store the prior Saturday we had a power outage due to a big storm and I was pleasantly surprised to see so many nice people still showing up to make purchases and see my demonstration. Please join me this Saturday at the Soquel store from 11am-1pm and then Monterey from 3-5pm. I look forward to seeing you there!" We look forward to seeing you there too, Theresa :) Thanks so much for everything! Our Angel Project was recently featured in the Carmichael Times.